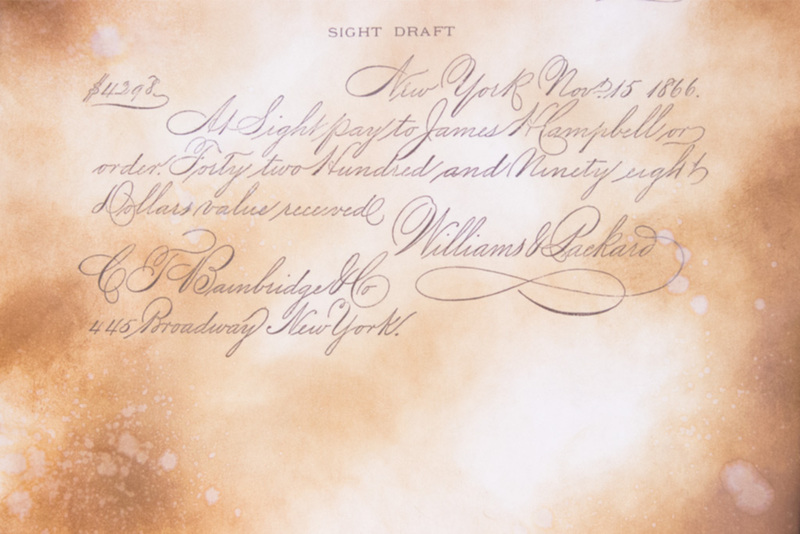 The translucent look and distinctive feel of vellum….is it possible to recreate it with common materials? 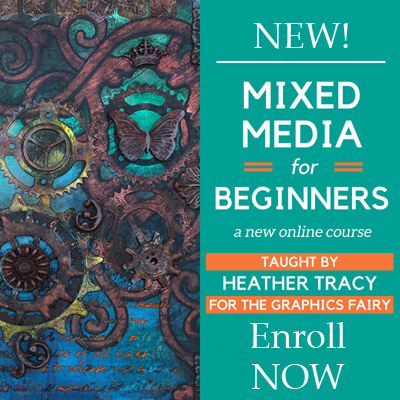 Hey there, my Graphics Fairy Friends! It’s Heather from Thicketworks. 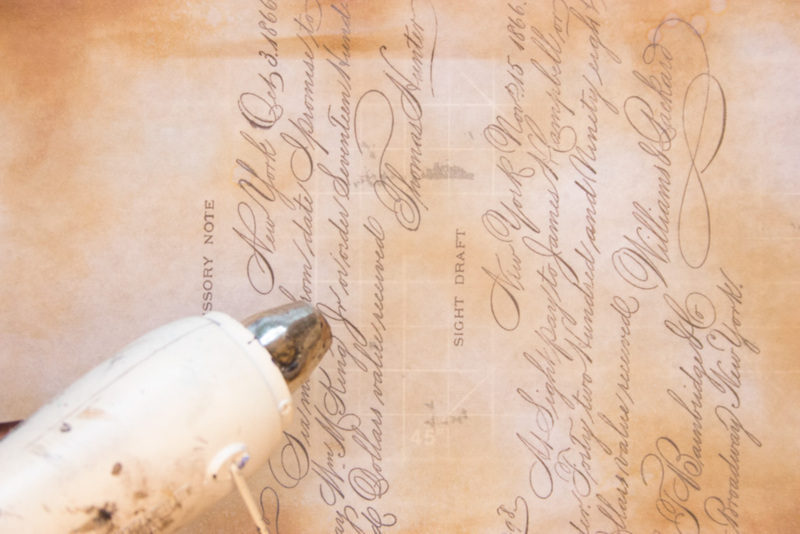 A recent project required that I find a way to transform ordinary printer paper into ‘Vintage’ manuscript paper. Yes, I could have reached for commercially available vellum, but exploring ways that we can enrich the qualities of ordinary materials is one of my passions. So, while pondering why vellum appeals to the senses, I began to consider ways to imbue modern paper with that deliciously mysterious ‘see through’ quality that we associate with vellum. 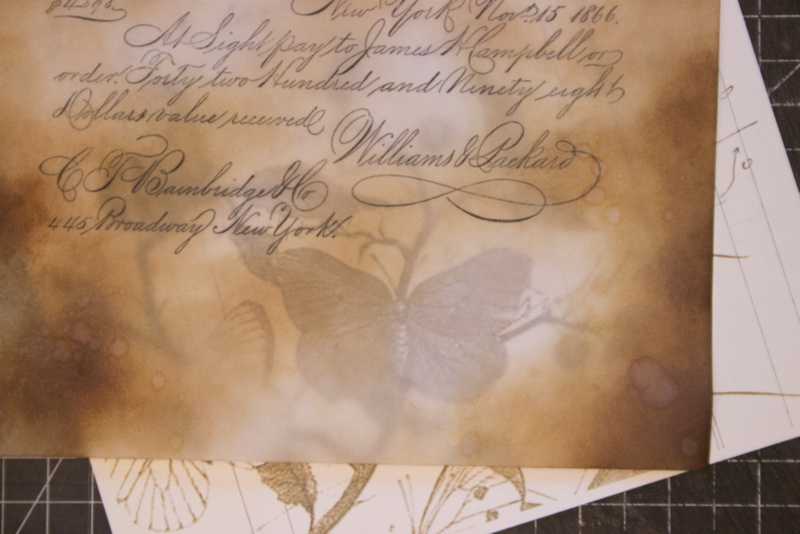 The result is a DIY Vellum Technique that holds promise for many different applications. So, let’s see how simple it is to achieve, shall we? If you would like to experiment with this technique, you’ll need a few things. Begin by printing your chosen image or text onto regular printer paper. Either Inkjet or Laser copies will work. 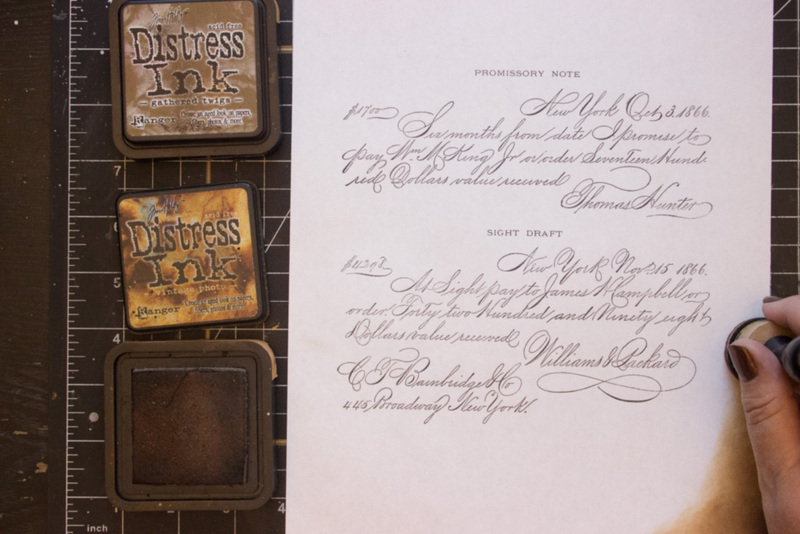 Once the printed ink is dry, blend Distress Inks onto the surface, adding depth and history to the page. 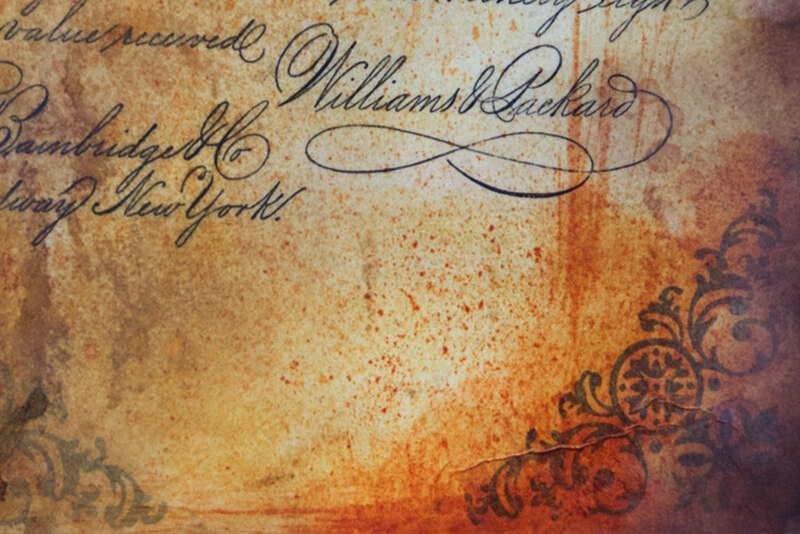 Add splatters of water over the blended inks – this will result in unevenly ‘bleached’ areas that increase the feeling of history and age. 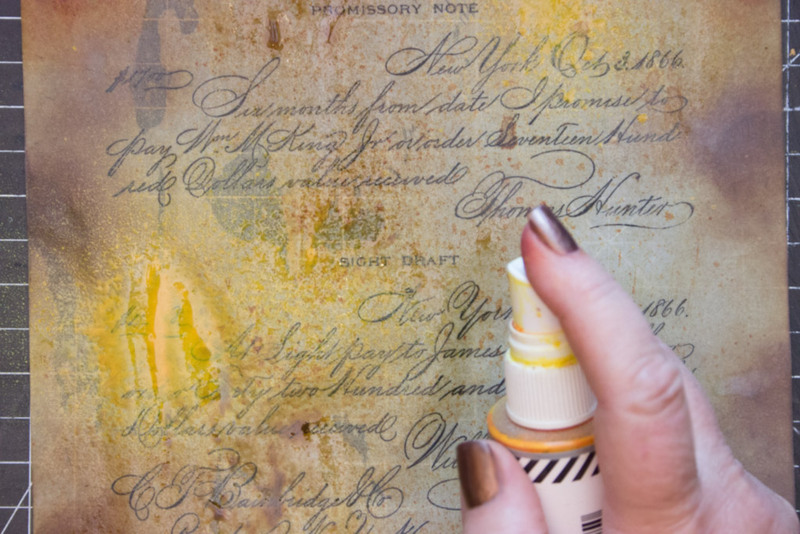 Next, use a paintbrush to apply a generous layer of regular Baby Oil over the surface of the paper. Make sure to work on a surface that can be easily cleaned of oily residue, like this cutting mat. 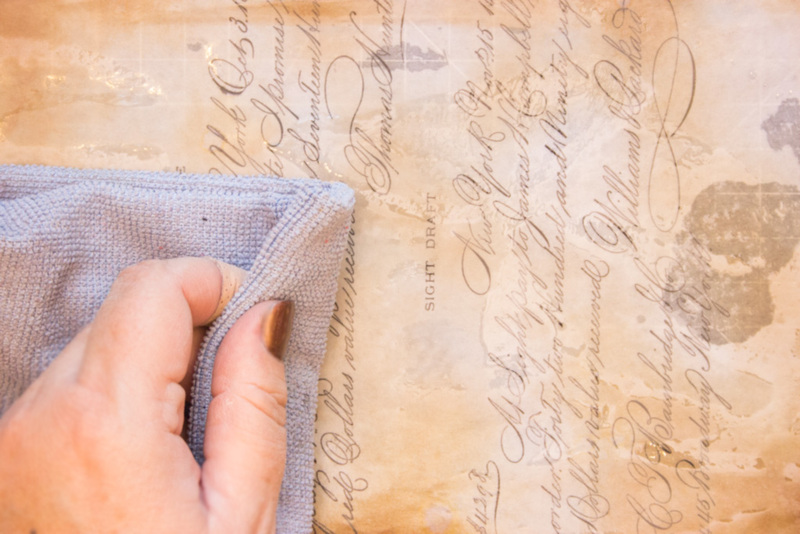 Use a soft cloth to wipe away the excess oil from the front and back of the paper. You can choose to use a heat tool to speed up evaporation of the remaining surface moisture. 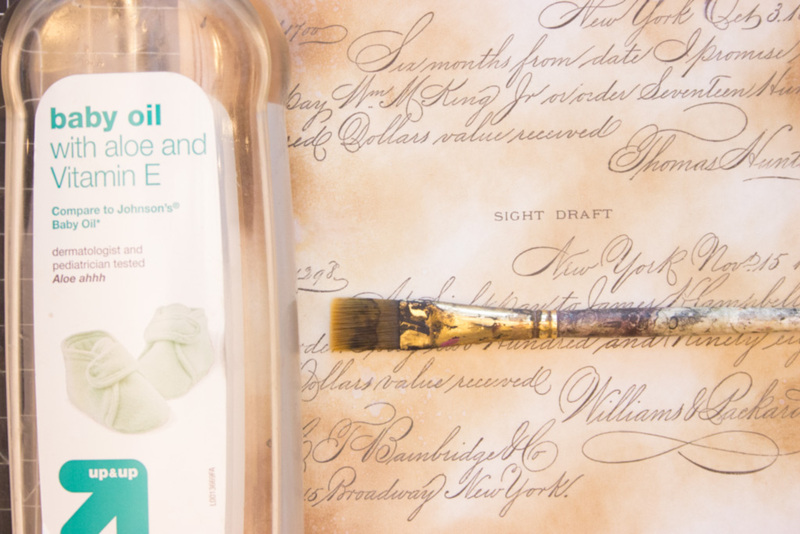 Once the paper is dry, and you no longer feel an oily surface, you can incorporate it into your project! Here, I’m admiring the translucency of the finished DIY Vellum by placing it over a printed image. Loving the way that the underlying image is softly filtered by the now-ancient feeling ‘vellum’. What about adding other media or adhesives? Will they work with the ‘oily’ paper? 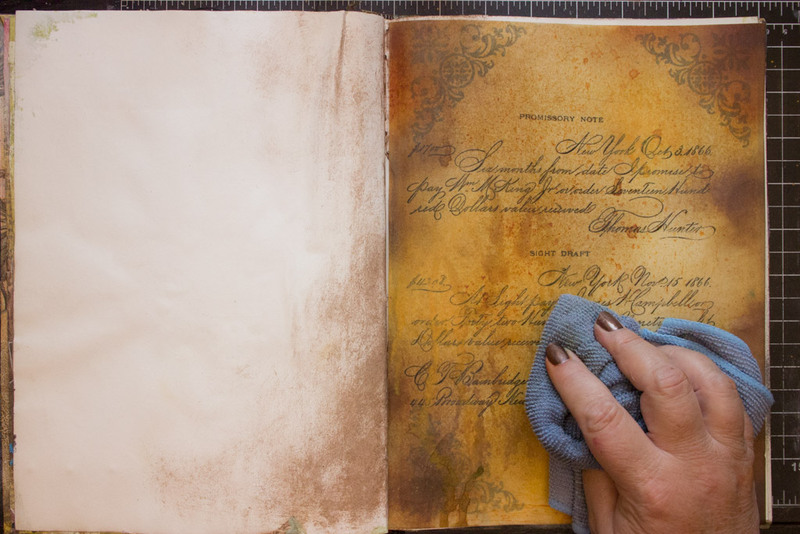 You can work with the DIY Vellum ‘as-is’, or you can add even MORE distressing. The surface is surprisingly receptive. I was looking for a pretty intense effect, so reached for Distress Stain. 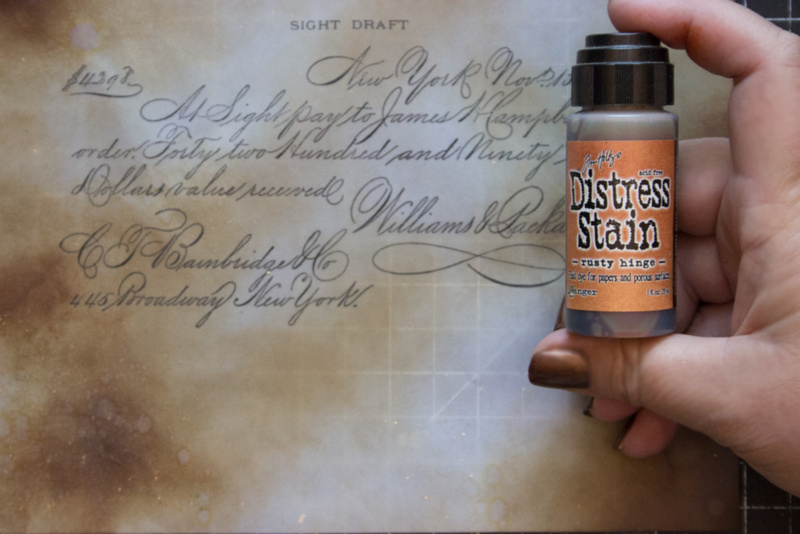 By scrubbing the surface and flicking stain with an old toothbrush, the Distress Stain gives even more soul to the DIY Vellum. To bring just a touch of sparkle and light to the surface, you can add Spray Ink, like this Color Shine. 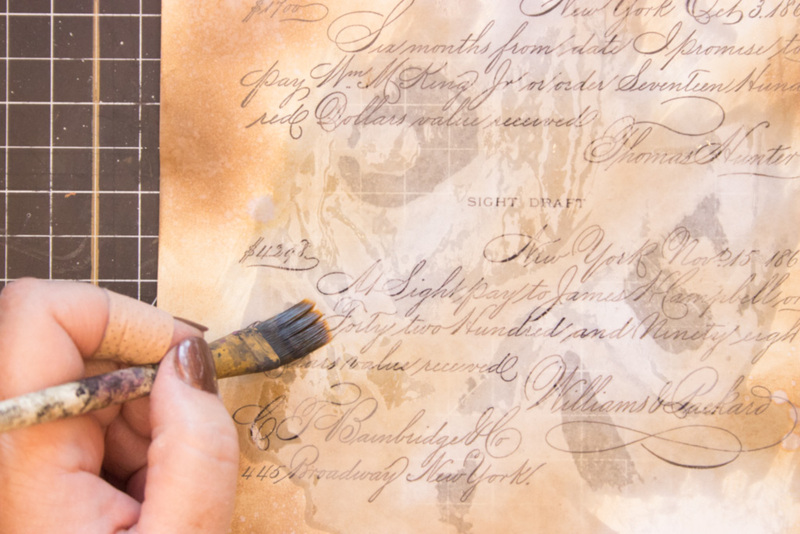 Once the surface is dry, you can adhere the DIY Vellum over other imagery for mysterious depth. 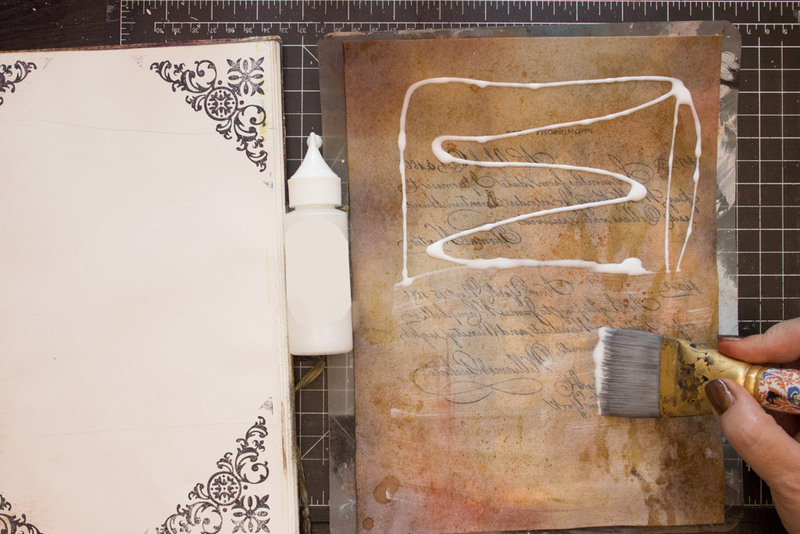 Here, I’m preparing an Art Journal Page by stamping corner embellishments with Archival Ink. 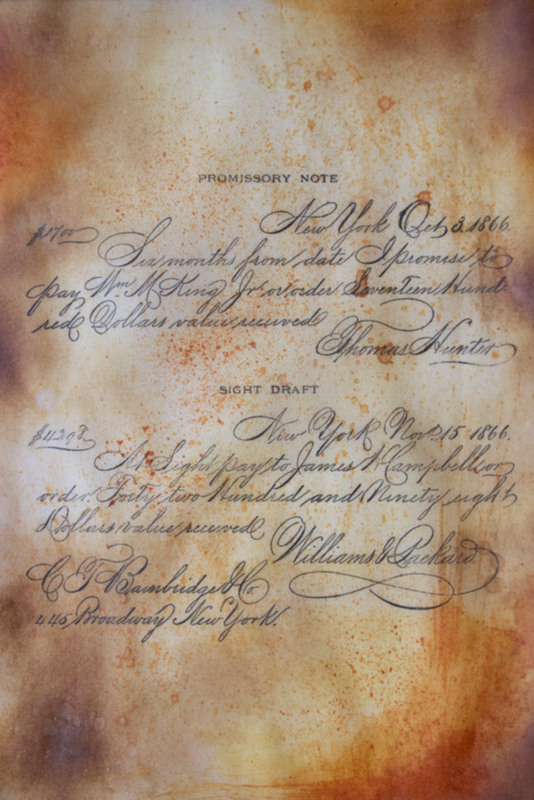 Once the DIY Vellum has been adhered onto the page below, you can see the stamped corner embellishments ‘shining through’. The effect is subtle, slightly romantic, and and elegantly aged. The underlying motif shows through the transparent layers of Distress Inks and Stain, even where the pigments are most intense. 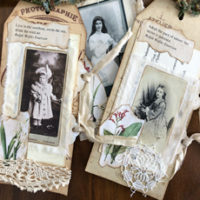 I’m sure you can imagine many uses for this DIY Vellum – soft overlays that preserve precious photos, ancient labels, distinctive party invitations…the applications are limitless. As always, it was exciting to develop this technique, and even MORE fun to share it with you here… Thank you for visiting The Graphics Fairy today! For more unorthodox crafting techniques, visit Thicketworks, where there’s a cozy seat by fire just for you! « Nostalgic Wine and Grapes Art Image! Heather, I can’t wait to try this. Thanks for sharing! Amazing! Love it and thanks so much for explaining the technique!!! Oh my….. I LOVE it! Thanks so much for sharing this. well…………this is just the neatest effect. I’m doing a Victorian calendar for the month of February. This will be great. April, thank you for sharing this. 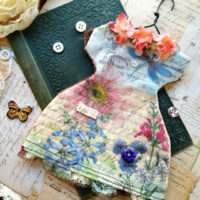 I love manipulating and transforming paper. 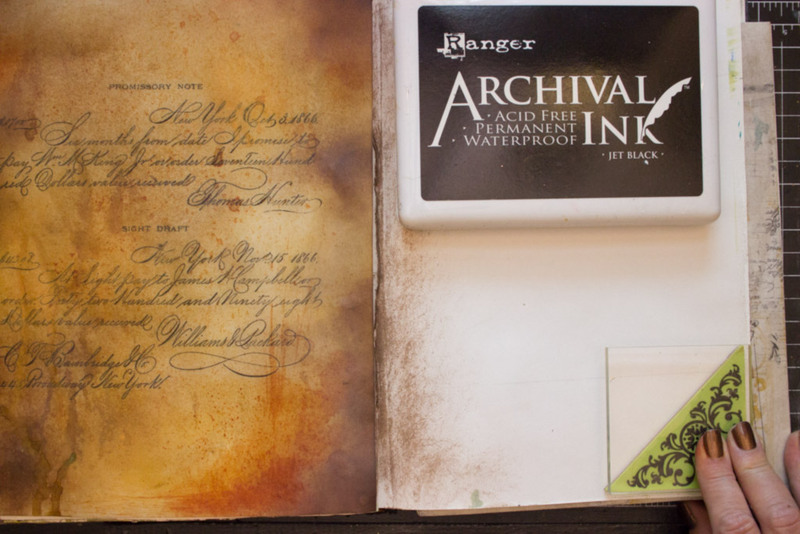 I once used a special vellum, and dyed it in coffee. It had a wonderful strong coffee smell. I used it on some “Let’s Have Coffee” greeting cards. I had some left over in a plastic envelope, and it still smelled of coffee, at least, a year later. This is an awesome technique. One of the things I like about it – in addition to the beauty of the finished page – is that it is inexpensive and uses supplies that we already have. I tried it with an old, already aged, dictionary page and ran it through the printer using a black and white line drawing. I regret that I didn’t take a photo before I made the greeting card and sent it. Oh how lovely and easy! Thanks for sharing this technique!!! What a great technique. Thanks for sharing. Hi Rupa! Darn it, I wish we could pin down why your comments sometimes don’t take…that is so frustrating, my friend. 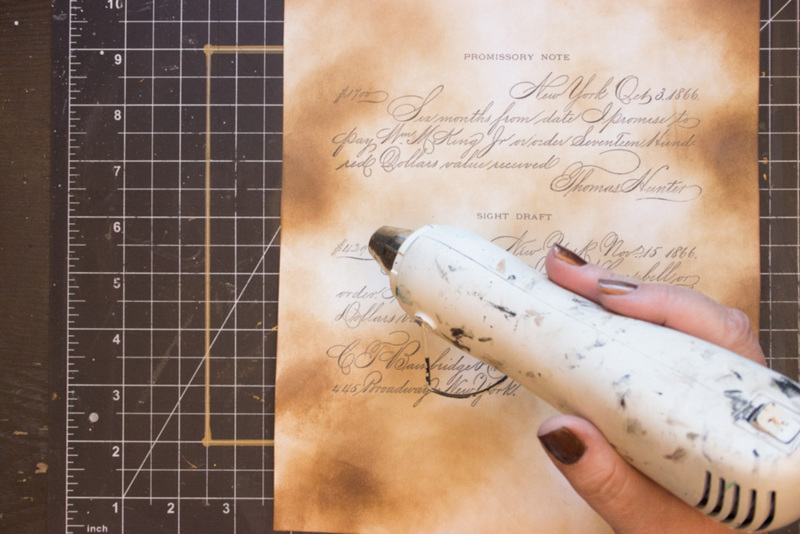 It pleases me no end that you can use this one – it was SO exciting to create the method, and I’m filled with ideas about how to incorporate DIY Vellum into projects! Oh yeah, persistence and tenacity are my middle names lol! I am not a quitter for most good things….love you and GF too much to quit on you sweet ladies :). This looks like a fun project. 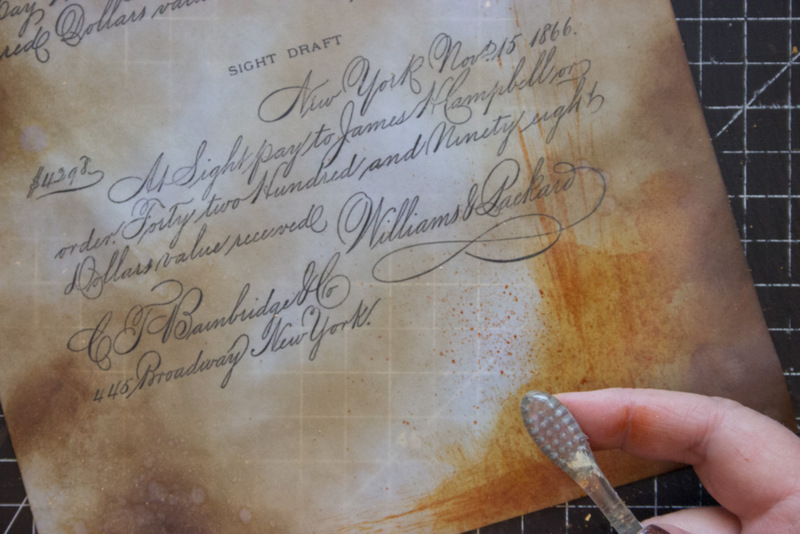 The vellum means you can layer to add depth. Thanks for sharing. Oh my goodness Heather! Absolutely gorgeous! 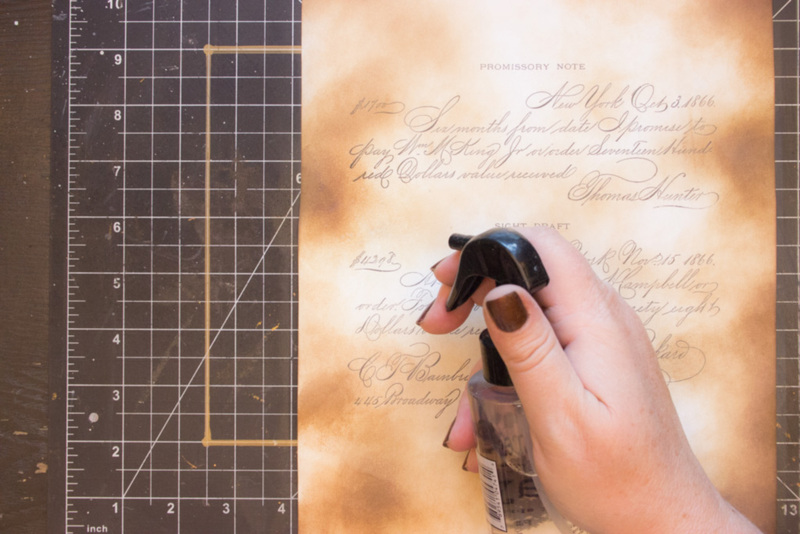 And this tutorial uses everything I have, except for Distress Stain. I love the romanticism of what you’ve created. Thanks you so much! How timely that I have come across this! 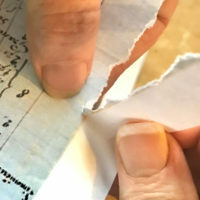 I have just used the last of a patterned vellum that is no longer available, but I think I can get close to it using this technique. 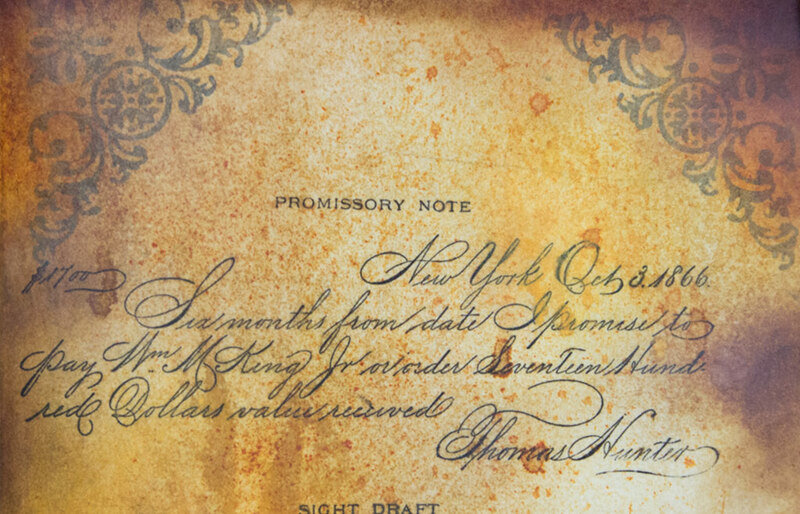 If I emboss it with gold ink and embossing powder I might even get the foiled effect of the original. Thanks!!! That is wonderful Shelley, good luck and enjoy!